All our cabinets are manufactured in the UK from 18mm thick MFC. Wardrobes and Glidor interiors include hanging rails, cam fixed strong shelving, 18mm backs, soft close hinges and 100mm adjustable legs. Standard hinged wardrobes are 2260high x 580deep. Glidor interior heights are made to measure depending on your ceiling height. 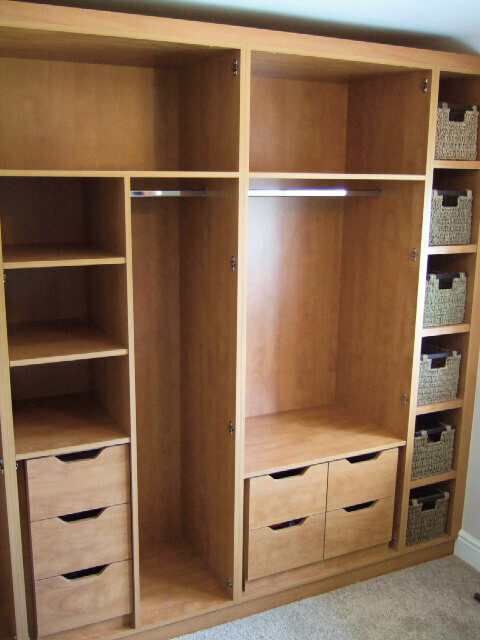 As well as the standard bedroom cabinets we also offer a custom-made service, capable of producing cabinets to any size, height, width, depth and combination. For all non standard size units there is a 15% additional charge to each item. We offer many optional extras such as pull out shoe racks, pull down hanging rails and pull out pivoting mirrors to name a few. Matching free standing furniture will have full height side gables and18mm backs we offer you both types of drawer box depending on your budget. Come and visit our Drapers Yard Studio 7 to see all these qualities in motion. The standard drawer box we include in our prices is the tried and tested BLUMOTION function with: Ensuring that drawers always close silently and effortlessly – independent of the closing force or the weight of storage items.A new, and purpose built variation of BLUMOTION has been developed for single extension METABOX. With a maximum load capacity of 25KG, BLUMOTION has been perfectly engineered to to give excellent dampening whilst minimising opening forces required. Incredibly practical and economical: You only need one BLUMOTION unit up to a cabinet width of 900 mm. We offer an upgrade to Legrabox drawers which are available in Silk White or Charcoal Grey. 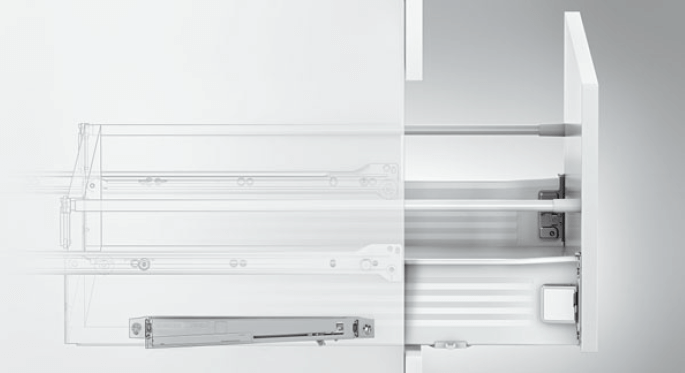 There are several advantages to upgrade your drawers to the new LEGRABOX system; Elegant design for every living area and compatible with the AMBIA-LINE inner dividing system. Totally NEW runner system that has won several international awards. Minimal opening force and synchronized smooth running action, full extension drawer runners so you can gain full access to your items. Load capacity of 40kg and 70 kg with built in safety adjustment and features. Take a look at the LEGRABOX demonstration video. AWARD WINNING SUPPLIER | WHY BA? BA Components is our chosen supplier of our full bedroom range items; Urban, Bella, Zurfiz & Glidor. Established in 1990 and operating from Cookstown and Doncaster, BA Components has grown steadily to become the major manufacturer of kitchen and bedroom doors and accessories in the UK and Irish furniture components industry. The decision to replace a kitchen or bedroom isn’t something a customer does lightly. With BA as our supplier, anything is possible. Quality, choice and a brilliant finish. BA Components are the largest door producer supplying small, medium and large kitchen, bedroom and bathroom companies worldwide. With bespoke, made-to-measure doors and an extensive range of matching accessories & handles, BA was our number 1 choice. BA is a market leader. Winning many awards over the years and currently nominated for the the 2016 BKU awards. The bedroom products are marketed under the brands “Bella, Zurfiz & Glidor by BA” offering a wide choice of designs from Bella’s Timeless Classics to the beautiful Zurfiz gloss range or the modern Glidor sliding wardrobe doors. They have invested in software that provides a fully linked system from order entry to production planning and processing to dispatch. The order system is updated at every stage meaning we can communicate accurate order status information on request. An Order Acknowledgement is automatically emailed to each of our dealers containing full details as soon as the order is entered. BA is renowned for quality, sustainability, durability and cutting edge design. All perfect reasons for you, our customers to choose us. Our materials, production processes and designs are aimed towards the finest possible end product. That’s important to us, to you and your customers. Bella and Zurfiz bedrooms offer customers a wide range of choice and customisation, with multiple colours and textures. Everything from intense colours to subtle shades to cater for every taste. Our range of options is designed to help you give your customers the bedroom they desire. We are committed to quality and we have achieved the highest possible industry standard of FIRA Gold following the testing of a selection of our doors. Tests : BS 6222 : part 3, BS EN 312, BS EN 622, FIRA standard 041, FIRA standard 048, FIRA standard 6250. The FIRA Gold Award is the ultimate mark of excellence in the furniture industry, certifying that a product meets all necessary standards. Our manufacturing takes into account ecological and environmental considerations. We use renewable energy sources where possible and our raw materials are from controlled and well-managed sources. Our products hold FSC® and PEFC™ Certification, guaranteeing we promote the sustainable management of forests. All BA Products & Bedrooms installations come with a 6 year guarantee.